Description:Our Natural Area Rug is a versatile, neutral area rug that will complement all decor styles. Made in the India, this well-constructed rug is made of all-natural eco wool. We have gained recognition as an eminent enterprise, devotedly engaged in providing Braided Rug, which is available with us in several sizes and designs. We offer an array of Chindi Rugs (Braided Rugs) which comes in several shapes, sizes, patterns and colors. Chindi Rugs are made up with the finest quality & weave. Oval Mat Double Color Braided Doormat, Size: 15" X 24" And 18"x28"
Size: 15" x 24" and 18"x28"
These reversible oval shaped Doormats of 100% Polypropylene fiber are available in 9 beautiful colors. This braided rug is made of numerous fabrics printed is special designs and colors to create this beautiful rug. Which will surely complement and complete any room you use to in.This rug is manufactured in one of India’s most pollution free facility. 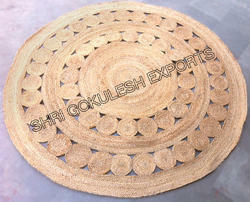 Hand spun jute braided rug with mixture of thick and thin and on the back heavy cotton backing. 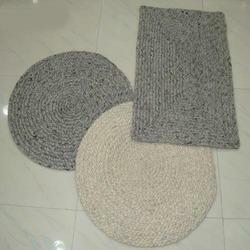 We are manufacturing wide range of highly creative braided rugs with hand knitted concepts. we have plain icn machines, plain tuffters, loop tuffters etc. We are manufacturing our products on canvas tufting as well as with rubber backing. we use Belgium quality latex for our products with good quality.